In a privilege speech before the Senate on Monday, Senator Ramon "Bong" Revilla Jr. denied the allegations linking him to the PDAF scam by confirming that his signatures in documents were forged. He did not speak early hoping that another issue like Zamboanga siege, Yolanda and earthquake would diverge the peoples attention and the PDAF controversy would die down eventually. Fortunately, it did not happen, so he has to defend himself. "Sa kabila ng pagyurak sa aking pagkatao, sa kabila ng pagkitil sa aking karapatan, sa kabila ng pagwasak sa aming buong angkan, kinimkim ko po ang aking nasa sa kalooban sa loob ng mahigit limang buwan. Narito po ako ngayon para humarap sa ating kababayan sa ngalan ng katotohanan," Revilla said. Don't be fooled by his handsome look and teary eyed speech and drama's. Please don't let Bong Revilla continue to steal money from the Filipino people. The kind of politician who is only after the money and not for the public service. Think many times and be a wise voter. 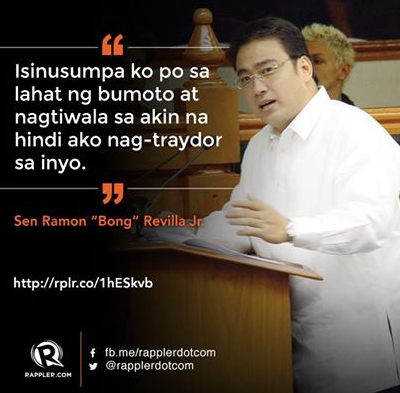 Bong Revilla do not deserve any position in the public office. 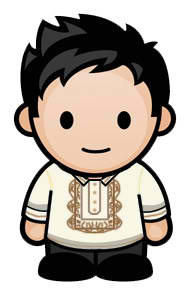 It is time for the Filipinos to wake up. We need to reach the poor people because they are the ones who are always get fooled by corrupt and greedy politicians. I just want to hear that he has no more plans in running for the next elections in any position even for a barangay captain's office, for the rest of his life. End of the story. THANK YOU! The most dangerous man to any government is the man who is able to think things out for himself (H. L. Mencken). He did not speak early on because he thought the issue would die down if another issues come in. Fortunately, Yolanda, earthquake and Zamboanga siege did not cool down this controversy, and I am hoping it will not until justice is served.